We congratulate Prof. Dr. med. phil. Anja Richert to the faculty internal teaching award for particularly good teaching in the academic year 2016/2017. Prof. Dr.-Ing. Jörg Feldhusen, Dean of the Faculty of Mechanical Engineering at RWTH Aachen University, presented the award on 15 April 2018. The Stifterverband also honored her with a teaching prize, the AVRiL 2018, in the category university teaching. 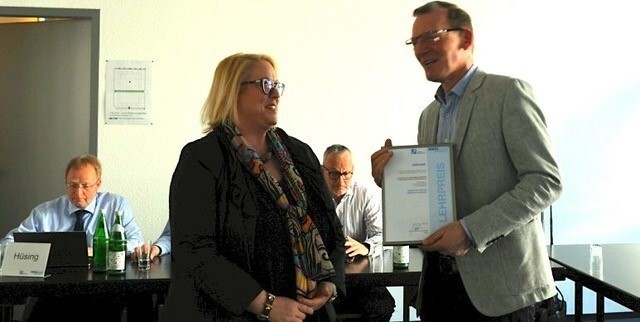 The AVRiL by the Stifterverband has been rewarding successful augmented and virtual reality scenarios since 2018 and awarded the augmented reality application developed by Prof. Anja Richert and her team for the lecture Agile Management. After 14 moving and exciting years of cooperation and cooperation in and with the Cybernetics Lab, Prof. Anja Richert now follows a reputation of the Technical University Cologne as a professor for innovation management. She began her scientific career studying communication sciences at the RWTH Aachen University in 1999 and joined the Center for Learning and Knowledge Management (ZLW) in 2004. She has been leading the center since 2011 as managing director, guiding its sound and continuous advancement. She also did research as a junior professor of Agile Management in Technology and Organization at the Faculty of Mechanical Engineering. Her work focuses on the agile management of learning and knowledge processes, the research and development of mixed-reality learning concepts, and the development and testing of data-science-based socio-technical research designs. In particular, she deals with the design of digitized worlds and robotics in the fields of education, industry and society. We thank you, dear Anja, for the many years of dedicated and creative cooperation! We wish you continued success in teaching and look forward to new cross-links between Aachen and Cologne. Awarded as "Excellent Place in the Land of Ideas"